Summer in Australia can be brutal and when your car’s air conditioning (A/C) unit is blowing hot air, it can be frustrating and uncomfortable. However, not having working A/C is also a safety issue - being inside a hot car during summer can spike your body temperature to a dangerous level. So, if your car is experiencing A/C issues you should take immediate steps to fix it, not only for your own comfort but, more importantly, for your safety. Here are six common reasons why your car’s air conditioning may not be working. The condenser is responsible for re-cooling hot refrigerant. This is done by using the airflow that comes through your car when driving. A condenser can become blocked from debris and, as a result, will be unable to cool your car effectively and will likely lead to your vehicle expelling hot air. The condenser can be visually checked from the front of the car under the grill. If there is no obvious debris in your condenser it could indicate that it is broken, and a replacement is required. The compressor is the heart of your A/C unit and without it you will not get cold air. A compressor can go bad simply through inactivity. When switched on again after a long period, the system can become shocked and need replacing. A way to overcome this is to periodically run you’re A/C at full blast – even if you don’t need it. 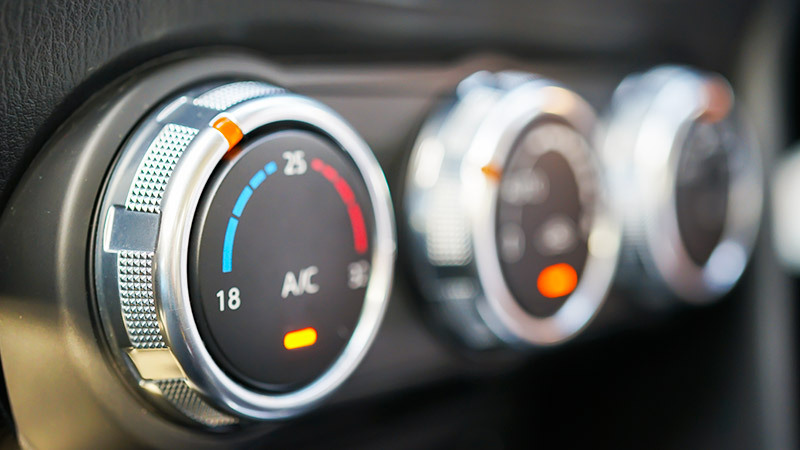 If your car has slowly lost the ability to cool things down, then this may indicate that the A/C unit has run out of refrigerant gas (the stuff that makes the air cold). To stay on top of things, your car’s A/C should be re-gassed every one to two years. A refrigerant leak can be quite difficult to pinpoint but are most commonly found at the unit hose connections. A technician can use a specifically designed air conditioning sealant to close the leak for you. An A/C relay is responsible for supplying power to the A/C system’s compressor and clutch. Without a working relay, your A/C unit will not function or may cool your car inconsistently. If the relay is found to be faulty, it is a simple matter of replacing the component. Electrical components are arguably the most difficult problem to diagnose on a faulty A/C unit and can mean your wiring is frayed or broken. An experienced professional can offer you a diagnosis and mend or replace damaged electrical components. To ensure your driving experience is both comfortable and safe, your air conditioning unit should be dealt with as a priority if you are experiencing issues. Automotive air conditioning professionals can diagnose why your car’s A/C system isn’t working and fix or replace the required components. Are you having trouble with your cars aircon? No to worry, AutoGuru can help you find local, high-quality mechanics to inspect and repair your cars aircon and have you driving comfortably through every season. Clancy has been working in, and writing about, the automotive industry for half her adult life. She loves her work and all things automotive and looks forward to the day she is considered a guru on the subject, an auto guru perhaps.